Looking for an Ombré Lip Color that will suit you? 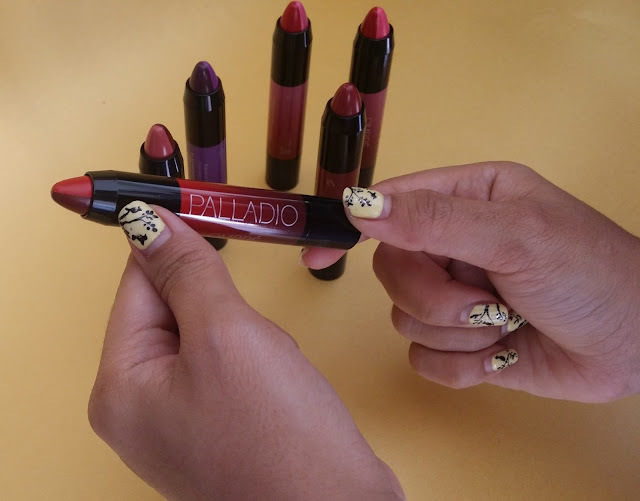 Well, Palladio Beauty has just what you need. 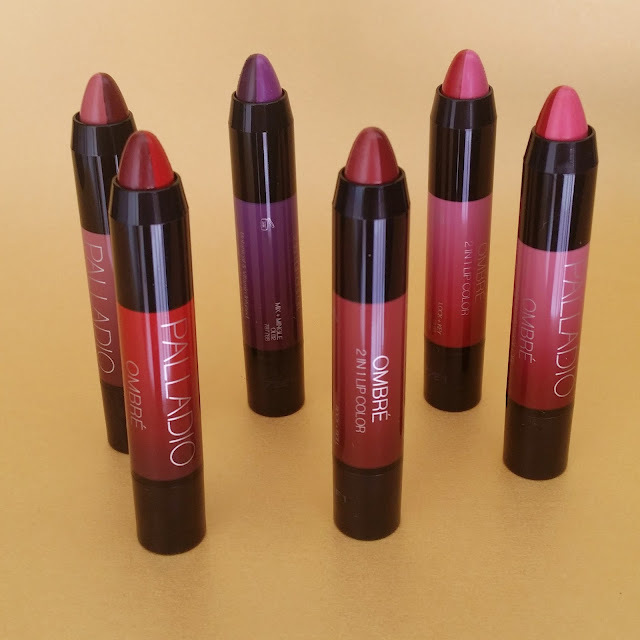 The recently launched Palladio Ombre 2-in-1 Lip Color is something that you can count on to give you that effortless ombré effect. What's exciting about this line besides the fact that the colors are all so beautiful, are the names of each of these lip colors. It's always a nice touch when brands come up funky and cool names for their products especially if the names match the colors. Let's get down to the product details, shall we? 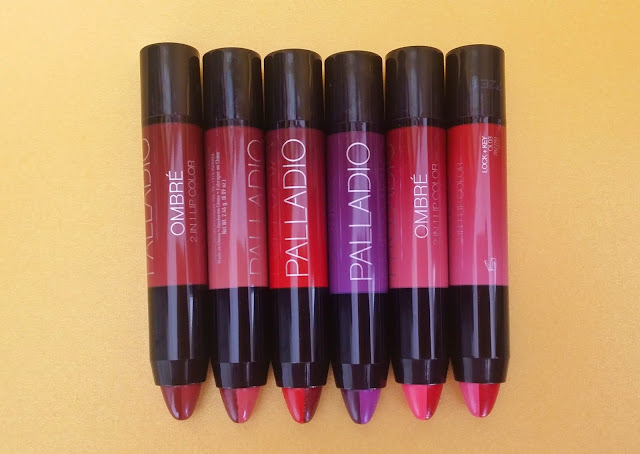 Basically, the Palladio Ombre 2-in-1 Lip Color is divided into two sections- a dark and light shade of which the darker shade is to line the lips and the lighter one which creates definition and that ombré effect. It comes in 6 different shades, from a light pink ombré effect to a more dark berry shade. What we all love about Palladio is how it is Botanical & Vitamin Infused. The dual ombré Lip Color comes in a pencil shape which is easy to apply and mix. Use one side to line and the other to fill in the center of the lips. 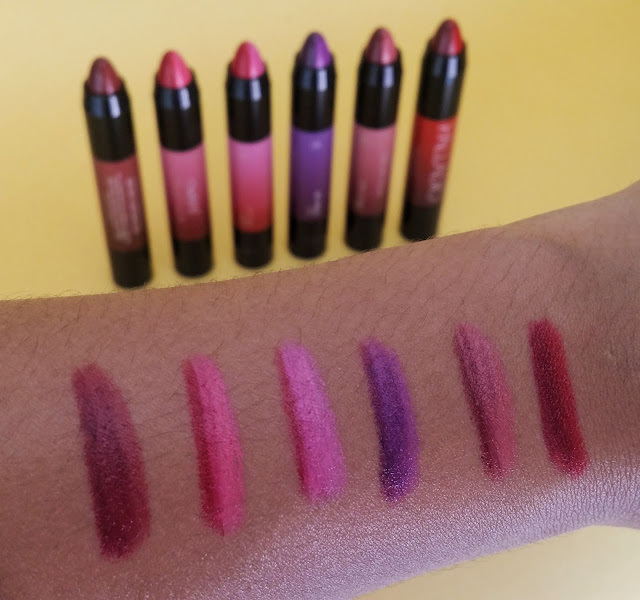 This sort of design, makes it easy to apply and mix the colors compared to the ones that come in the usual lipstick design of which the product is either round or diagonal. This is because you get to create the depth of how you would like your ombré lips to look like. The standard diagonal lipstick design makes it harder to apply on the bottom lips and may seem messy. Twist the bottom of the pencil for more product. What I love about this is that you can create that clean ombré effect without worrying if you're gonna dirty or mix the colors together. It is not kiss proof and not matte, so don't go kissing anyone 💋🙈. It has a velvety feel upon application. It has a smooth texture that glides very nicely on the lips. The swatches done on my hand seems pretty opaque and pigmented which I like. What I would suggest though when creating this ombré look is to ensure that there are no harsh lines between the two colors. In other words, ensure to blend the color with either your finger or a lip brush so that the transition between both colors are not so obvious. Don't worry if you can't perfect it, this lip color makes the job easier. Another good thing about this type of design is that If you do decide to not go ombré, you can still use the color you like. Just turn to the pencil to the color you like and apply! These Ombre Lip colors by Palladio is long lasting. I tried it on one of the shade and it survived me having tea. What could be improvised this time around would be the scent. Palladio is known for its botanical infused ingredients that makes their products smell really natural and not so chemical-y scented. The other lip products from Palladio has a very light vanila and shea butter scent. However, this time around, it has that light chemical scent to it which I wish was not the case. That would probably be the only feedback I'd give. Everything else is on point. This is my current favourite that I tried in Naughty + Nice. What do you think? Will be posting a full lip swatches soon! As always, more information is on their Official Website and you can stalk their Instagram for latest product launches too. 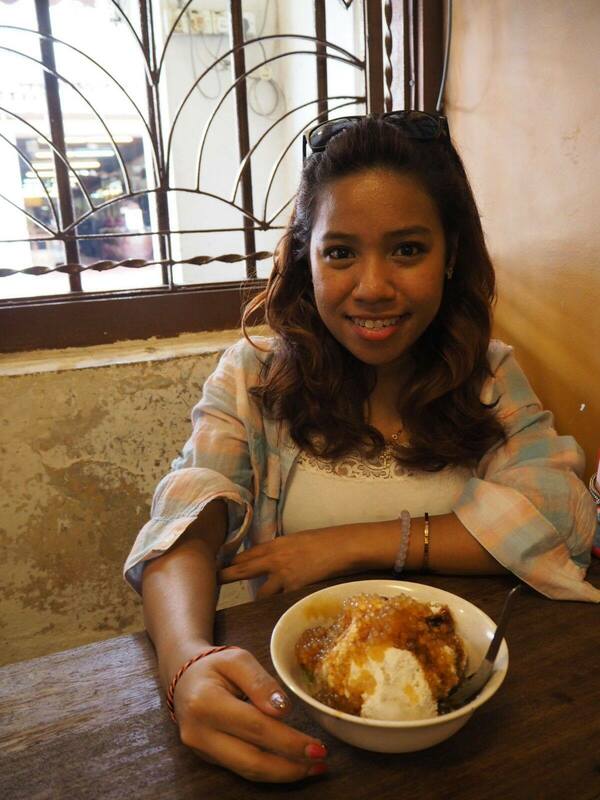 Otherwise, head on to Guardian Malaysia stores across Malaysia to give them a try. It retails at RM39.90 for 2.46g worth of product which is very affordable. IF you've tried this and have a favourite color do share with me! Gosh! 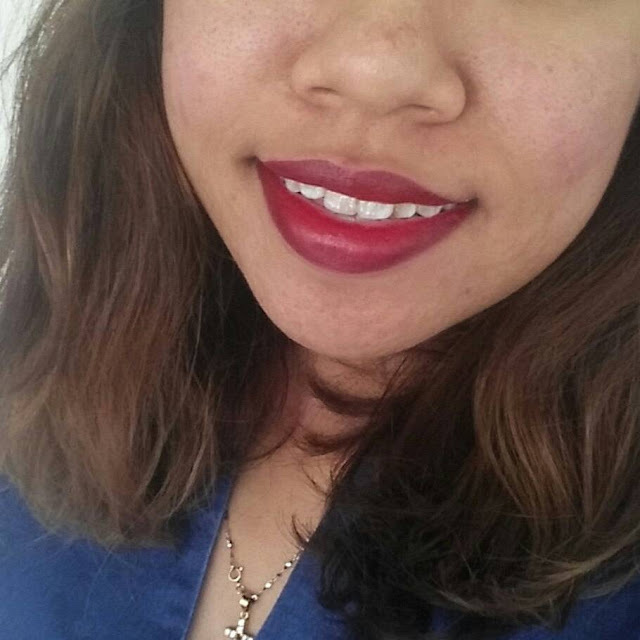 The palladio ombre lip color is really nice! So cute. I wanna try one too. Ombre lip color I think the heart and soul suit me well. Colour looks really good. And it freshen you up a lot! Wow I really love the beautiful colors. This Palladio Ombré looks great and would love to give this a try. I like to own all these shades for different occassions. Price is affordable too. All the shades look beautiful! My favourite is rock+roll shade. ombre lip color? OMG. It reminds me of the laneige one. But then this is so much affordable. Yes, me too, but i think this is much easier to apply. The lip shades are so happening. I love the two-in-one effect as well. Haven't found something similar so I might just get myself one. Guardian is just in my neighbourhood.